Below is the sheet music for Slow Movement Piano Sonata Op.2 No.14. Ludwig van Beethoven (also known as Bethofen, Bethoven, Beethofen) is the writer of this piece of music. In order to see the sheet music for Slow Movement Piano Sonata Op.2 No.14 please click on the preview button next to the score you are interested in. If you want to see just the available scores for one instrument, then please select the desired instrument that you would like to preview in the drop-down box a little further down. This only applies when offer this arrangement for a number of different instruments. 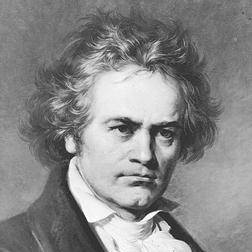 If you would like to leave a review of the Ludwig van Beethoven (also known as Bethofen, Bethoven, Beethofen) sheet music on this page, then please click on the tab "Comments". Would you like to share this track with your friends? Then just click on the share button on this page, and you can tell your friends an family about this awesome track. Slow Movement Piano Sonata Op.2 No.14 is available for 1 instrument. There are 1 arrangement to choose from.